Recording music for film is an expertise unto itself. There are only a handful of engineers that do it regularly because large scoring dates are becoming scarcer these days, and most composers will only trust their recordings to someone with a lot of experience. Dennis Sands has been recording orchestras for films for more than 30 years and has a sterling reputation for getting the best and most accurate sound possible. Here's a great interview with him where he discusses some of the scoring stages in Hollywood, how he got started, his gear and how he uses it. By the way, in the video he talks about a "Decca Tree" as his room mics. 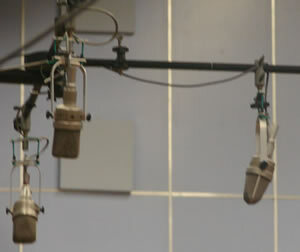 This is standard operating procedure for many orchestral mixers and it consists of 3 Neumann M50's suspended above the conductors head like in the picture. You can read more about a Decca Tree here or see the Recording Engineer's Handbook for more detail. Reader Gil Griffith requested a song analysis of U2's massively influential (as least from a charity point of view) "One," from their 1991 album Actung Baby. Rolling Stone placed the song at number 36 on its list of "The 500 Greatest Songs of All Time", while a special edition issue of Q, titled "1001 Best Songs Ever", named "One" the greatest song of all-time. As with all song analysis, we'll look at the song's form, arrangement, sound and production. The bridge is quite unusual as it seems a bit out of place in terms of the chord changes and it's not really the peak like in most songs. The melody is very strong, especially the chorus, which is a trait of U2 songwriting and the reason why they write hits. Of course, the lyrics are what most people site as the tune's centerpiece. The arrangement is pretty simple; start out very sparse and add more and more instruments to each verse/chorus until it's about as big as it can get by the end. The song starts with sticks and tambourine and three guitars; an acoustic, an electric through a Leslie speaker and an electric with the tone controls turned down. The next verse the bass and drums enter along with another guitar playing a line and another rhythm guitar. On the next verse a synth string pad enters along with yet more guitars, and after the bridge a piano, a lead guitar line, and even more rhythm guitars enter. I wish I knew how many tracks they used, but there's a lot going on here. U2 has never been entirely concerned about the sound of their records, going more for feel instead. That said, this one sounds pretty good, despite the massive amount of guitar and keyboard layers. The vocal has a medium reverb that disappears as the song progresses and the track builds. There's a short timed delay present that you can hear on the sticks and tambourine in the intro that's used on the instruments as well. You can occasionally hear the compression used on the various instruments, but it's used in moderation so it's never obtrusive. Daniel Lanois and Brian Eno have worked with U2 on most of their hits and you can tell they're very organic in their thinking. Two sections prove that - the intro and the end. First of all, the song has a count-in, which you hardly ever hear on records since it more or less denotes a demo. You can also hear guitar hum underneath. Most bands wouldn't have the courage to leave those in. The ending, on the other hand, is very ragged, which is almost unexpected, considering how well the rest of the song is put together. That's the U2 way though, as leaving a ragged edge is what they prefer. There's a lot of stories about the producers, engineer (Flood), and band struggling over the mix for weeks. It's not surprise with all the layers, but given that, I'd say the mix ended up being one of the centerpieces of the songs. Here's a great video from the AES archives where legendary mastering engineer Bob Ludwig talks about mastering the famous Led Zeppelin II record. It's a short video, but rich with anecdotes, as you'd expect from Bob. Hopefully I'll run into Bob at the AES convention in New York City next week. Perhaps I can get an exclusive story out of him, if I can fight my way through the crowd that inevitably surround him. You can find out a lot more about Bob at Gatewaymastering.com. If you've never been on a real tour, it's easy to think that they're all like U2 or Alecia Keys, but there are actually a number of different types, categorized by their duration. 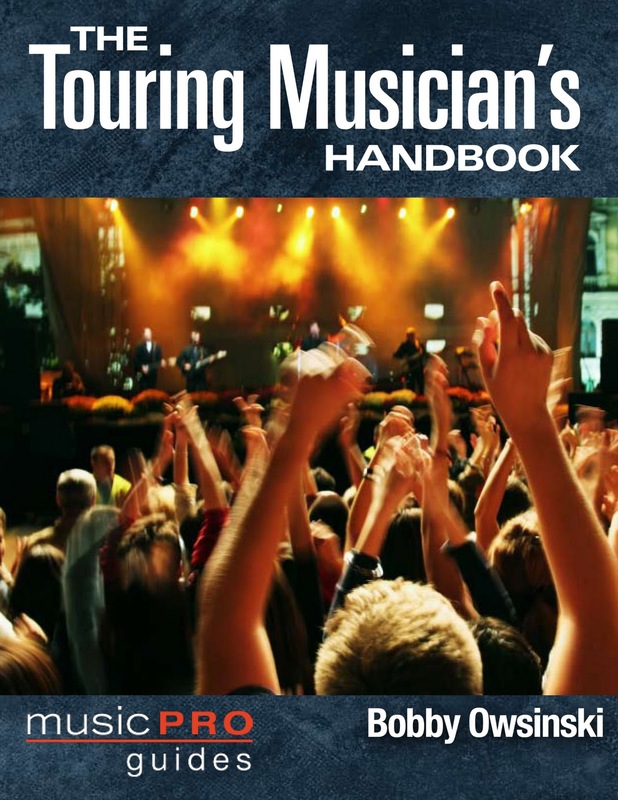 This excerpt from The Touring Musician's Handbook outlines the differences in each. "Tours can be divided into six general categories of duration; local shows, one-offs, fly dates, mini-tours, full tours and corporate gigs. Let’s look each one. Local shows are easy. You get to sleep in your own bed, you probably have a good bit of the day (at least the morning) to attend to personal matters, and you get to play in a familiar venue in front of friends and family. You can’t really call a local show part of a tour (unless you happen to be passing through town during a real tour), but these types of shows are frequently used as a warm-up before the tour starts. It’s a good time to fine tune the set list, hone the production, and tighten the band. It’s a sweet gig, but there’s never enough of them and they’re all too short. Fun, though. The one-off is a single show where you return home after it’s completion. It can be relatively local or it can be half-way around the world, but regardless of how long it takes you to get there, you’re still only playing a single show. The typical one-off generally means that there’s at least some travel time involved (you might arbitrarily say a couple of hours) which basically means that your entire day is consumed leading up to the gig. If you can’t do much else in your day but travel, sound check and play the show, you’ve experienced a one-off. The Fly-Date is the most desirable type of one-off that you can get, and means that you’re flying on a plane out of town for the show, then directly returning either the same day or next (it might take a little longer it your gig happens to be in an exotic place). You may do a series of fly-dates, but you’re always returning back to your home base after the gig. Acts like Aerosmith and Madonna might only do fly-dates for an entire tour, but they have private jets that can take them exactly where they need to go and bring them back to their airport hub directly afterwards without having to worry about the rigors of commercial aviation. That’s not the case for the players in a touring band, who may have to fly commercially, although it may be in business or first class. Anything that’s two dates to a week on the road is considered a mini-tour. This means that you’re away from home for that entire duration and don’t see your bed at home until you return. If a band from Boston books a show in New York and then returns directly home after the gig, that’s a one-off. If it books shows in Providence and New Haven on the way and doesn’t return home to Boston after either one, that’s a mini-tour. Mini-tours are inefficient and difficult to make money on since there are are few economies of scale with labor and rentals. The bus, bus driver, techs and tour managers usually cost more since everyone would rather take a longer gig for the job security, and a short gig might get in the way of that happening. Aside from the money aspects, it is a desirable gig, since you’re not away from home for very long. Once you get past a week out on the road where you don’t return home, you’re on a full tour. Tours can range from a week to a couple of years, in the case of a major act with a hit album. If the album continues to sell, the tour will keep going in order to take advantage of the sales momentum, even returning to play the same city a second and third time. 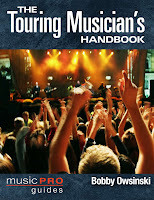 Many touring musicians refuse to sleep at home even when a tour travels through their home town, preferring to stay in the mood and rhythm of the tour. Even though it might feel good to sleep in your own bed, it can be mentally disruptive, not to mention financially harmful since the business manager might decide that you don’t need the per diem for the day since you’ve telegraphed that you didn’t use your hotel room. It’s OK to go home to do your laundry and check in on things though. The corporate gig is a somewhat modern event where an artist or band plays what amounts to a private party for a corporate entity. Once upon a time this type of gig was frowned upon and deemed a “sell-out,” but as the touring business has become more mature and financially aware, the corporate gig is now the industry’s cash cow. 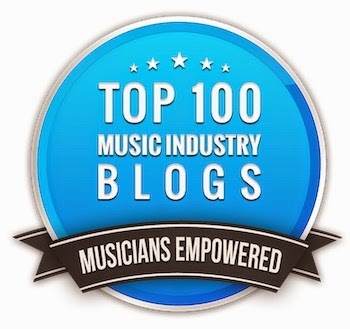 It’s now become commonplace for a Fortune 500 company to hire superstar acts and pay them sums that exceed their normal nightly take when on tour, but much smaller acts (including many that don’t have national visibility) benefit immensely as well. Corporate gigs are normally one-offs and fly-dates, since most are so lucrative that they’re worth playing even if the artist or band is not currently on tour." To read additional excerpts on this and my other books, check out the excerpts section of my website. I remember the first external hard drive that I bought in the 80's. It was huge, held only 5 meg of data, and cost about $4,500. I thought it was so cool. Now many of us have gone through floppy discs, Zip and Jazz drives, CD's and DVDs, and flash drives for data archival. Still, for any serious audio or video work, every day we depend upon those highly evolved high-speed platters revolving at around 7,200 RPM. That's why I thought you'd enjoy this infographic on the history of digital storage from Mashable. First, let me make one prediction that I feel certain will come true. In five years we'll look back at rotating hard disc drives the same way that we look at floppy discs today. Long live SSDs (solid state drives)! Click on the graphic then click again for a higher-res version or try here.